Product prices and availability are accurate as of 2019-04-19 10:14:28 EDT and are subject to change. Any price and availability information displayed on http://www.amazon.com/ at the time of purchase will apply to the purchase of this product. 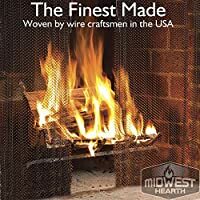 Replace those warped, rusting or worn fireplace panels with a set of Midwest Hearth Replacement Fireplace Screen Curtains. Each package includes 2 each 24" wide panels, each panel with rings and pulls. Proudly made in the USA! Measuring for a perfect fit: To determine the correct panel size, make the following measurement: Measure the height of present screen panel from top to bottom. Measure width of panel. All panels are 24" wide. If your panel is less than 24", the extra drape adds to the beauty of your fireplace. Panels ordered longer than your panel height may drag on fireplace hearth. Check clearance before purchasing: If you have no screen to measure from, take the following steps: If sliding rod is present, measure the heights from top of sliding rod to bottom of fireplace hearth. Deduct approx. 1" from total height. Choose the nearest replacement set, make sure overall height is not too tall, otherwise panel will drag on hearth. If no sliding rod is installed click on custom panels and it will guide you through the correct measuring steps. To determine the widths of the panels measure total width of fireplace opening add approx. 30% for fullness divide by 2 (two) which will give you the minimum measurement per panel width. All our replacement panels are 24" wide. BUILT TO LAST: Strong 19-3/4 gauge heavy-duty wire woven into interlocking spiral panels. HI-TEMP ENAMEL: Screen panels are finished with rust preventative hi-temp black enamel. ENHANCED SAFETY: Curtains feature a tighter weave for better appearance and safety. TWO (2) PANELS INCLUDED: Each panel is 24" inches wide and includes rings and cool grip screen pulls. 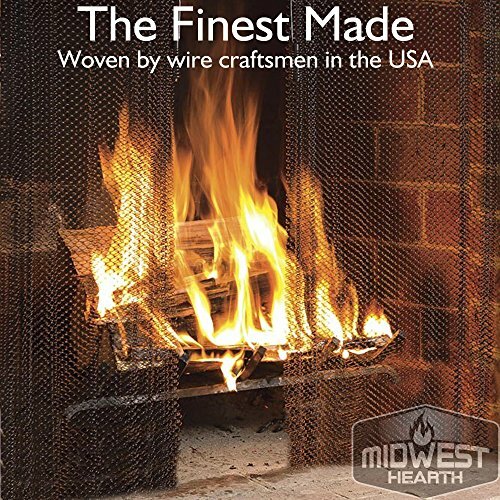 MADE IN THE USA: American made fire screens offer quality and value.